Marseille is a large city with lots to see and do, from historic sites to museums and churches to the Vieux Port with its waterfront restaurants, and shopping. 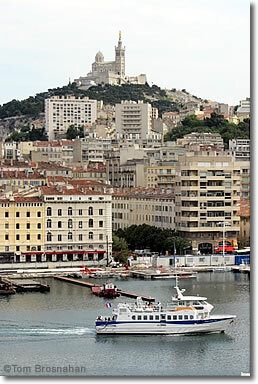 With a population of over 1.5 million, Marseille (spelled Marseilles in English) is a bustling city with lots going on. The main areas of interest to tourists are around the Vieux Port, or old port. The port area has been updated and enhanced for pedestrians, and a free ferry runs regularly back and forth from one side to the other. Notre-Dame de la Garde, high on a hill above Marseille. 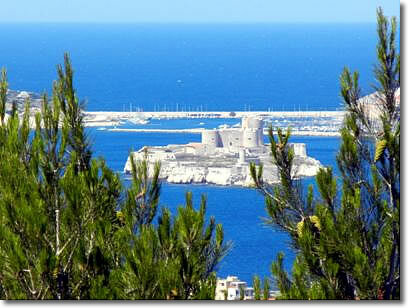 For the year 2013, Marseille was selected as European Capital of Culture. Over 400 cultural events were scheduled throughout the year and across the region. In preparation, Marseille undertook some major infrastructure work, which created major challenges for visitors in the preceeding months but resulted in long-term benefits for residents and visitors alike. Notre-Dame de la Garde church. Below, Château d'If and islands as seen from Notre-Dame de la Garde, Marseille.